Sometimes, the less you know about the inner workings of a hotel restaurant the better. Over the years, I’ve peppered hotel servers with questions about the provenance of some of their food offerings. And received answers that would curdle your stomach quicker than a pint of spoiled half-and-half. I once asked a server what farm a particularly insipid “heirloom tomato” came from, to which she responded, “Farm? What do you mean farm?” During another forgettable evening, I asked a waiter to pass along a question to the kitchen about our pasta, only to watch as chef duck for cover so quickly you’d have thought I popped a pin and threw a grenade into the kitchen. I offer up these past transgressions merely to illustrate how gratifying it is to run into someone like Pierre Daval, executive chef of the Three Embers in the Marriott Lincolnshire, who’s locavore upbringing in Alsace-Lorraine region of France has motivated him to ponder questions usually reserved for food symposiums at the CIA. Real esoteric stuff, like how a hen’s diet can affect the color of an egg’s yolk or the advantages that come with baking wood before it’s added to a wood-burning oven. You can trace Daval’s fascination with kindling back to November 2017, when the hotel completed a three-year $28 million renovation, including the introduction of a fire-licked concept called Three Embers, which is built around a giant Argentinian-style grill. It’s right there in the open for everyone to gawk at, complete with a wheel and winch system that allows the kitchen to adjust how closely the grill gets to its crackling heat source: a mix of slow-burning oak and fruity cherry and apple wood that gives rise to the restaurant’s name. Steaks. Chops. Rack of lamb. They all get the Argentinian grill treatment, which imbues these proteins—and a few fish options—with all the smokiness of a campfire cookout sans that ashy blackened crust you sometimes get from direct-fire cooking. Seafood options may change based on the season but our grilled monkfish—dubbed angler fish on the menu—played well with the flames. Given that monkfish looks and tastes a lot like lobster, it was surprising to see how a quick turn on this grill sealed in the fish’s juices and tenderize it a bit. Pulled from the grill our monkfish looked like giant tufts of popcorn, which are then glazed with a ginger-soy dressing and paired with an acidic mélange of cabbage and peppers to cut through the sweet glaze. For our money, it was a smart yet unconventional choice, which pretty much captures the overall vibe of what Daval and Three Embers’ chef de cuisine Jesus “Chuy” Medina are showcasing here. The small but focused appetizer list is full of surprises. Most chefs consider burrata to be too delicate to be defiled by anything more than a drop or two of basil oil and a side of heirloom tomatoes. 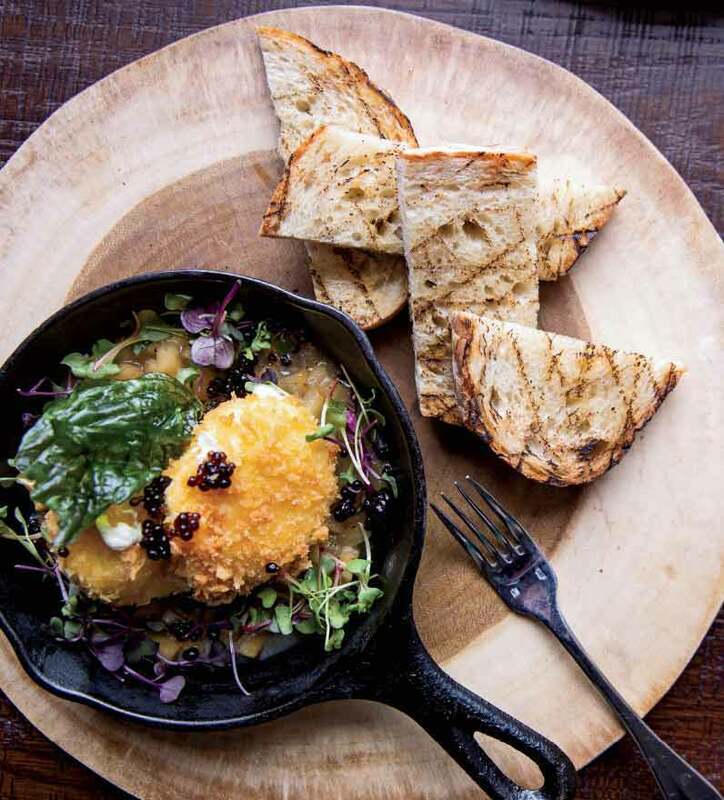 At Three Embers, it’s actually turned into an upscale play on a fried mozzarella sticks. Two huge burrata balls—looking like giant Christmas ornaments—are fried in a thin batter and set on what the menu calls an apple chutney. Truth is, it tastes more like the inner heart of an Alsatian apple tart. Sweet yet savory, crispy yet creamy—a dish that could pass as a post-dinner cheese course as easily as a intriguing palate opener. The same can be said for Medina’s signature pierogi starter, which he adapted from a recipe created by one of his mentors, chef Jimmy Papadopoulos. It’s not your typical pierogi in that the dumplings themselves aren’t pale and soft but rather sautéed to delightful crisp, similar to tiny fried masa caskes. The shredded veal cheeks themselves are then slipped beneath the pierogis in a kind of hash that resembles pulled pork, so you can fork them up both deconstructed parts and then smear it through horseradish sauce topped with beet powder. This freedom to defy convention confidence stems, in part, from the expansive garden and greenhouse that sits on the Lincolnshire Marriott’s lush 175-acre footprint. When the seasons turn warmer, carrots, tomatoes, root vegetables, and lettuces will be plucked from the ground and walked over to Three Embers’ kitchen. In addition, eggs as well as some of the proteins are sourced from nearby farms and purveyors, which yield bold enough flavors for the kitchen to execute the ambition plans. You can still order a chicken pot pie or a grilled seafood offering or two, but we found the most interesting entrees to be the heavier fare. The house’s giant pork shank, rinsed in a fruity pinot noir, is so tender it will fall of the bone quicker than you can say osso buco, but it’s the hearty helping of flageolet beans that will inspire memories of cassoulets gone by. 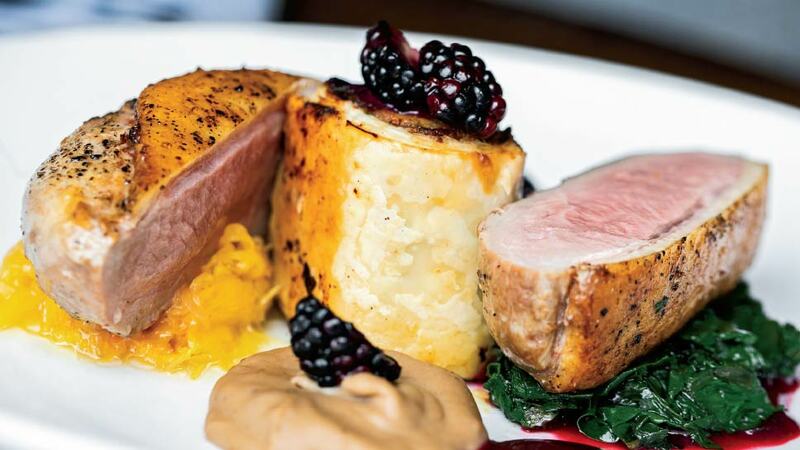 And at a time when fewer chefs are willing to serve duck, the kitchen knows how to keep things old old-school with its impressive duck duo: an appropriately crisply duck leg croquette filled with rich bits of duck confit and a perfectly prepared duck breast, all of which is set in a blackberry gastrique with little mounds of chestnuts puree. 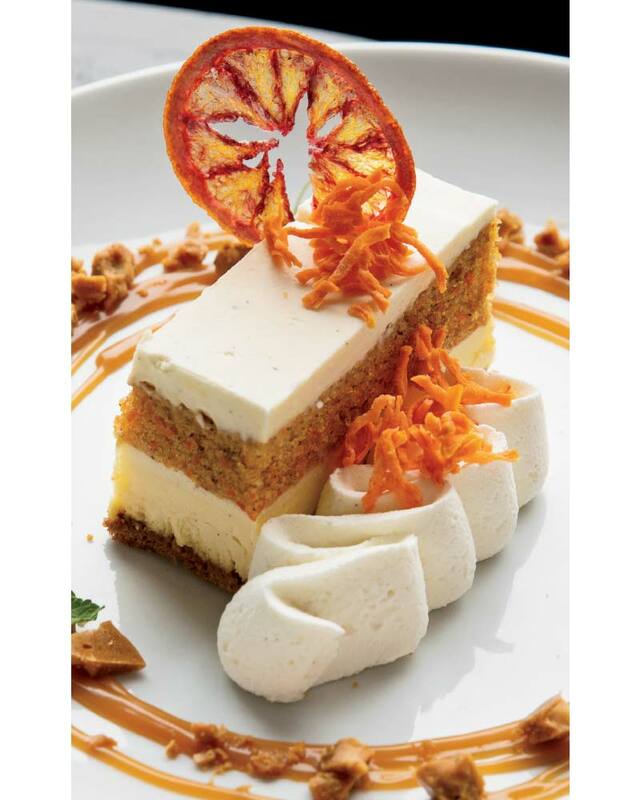 Desserts are equally welcoming, including an elaborately plated carrot cheesecake, which offers more layers than an English trifle: cream cheese, carrot cake, cheesecake and a graham cracker foundation. It’s sweet without being cloying and topped with a flourish of bright dried carrot confetti, an appropriate finish considering just how much there is to celebrate about Three Embers. Three Embers is located at the Lincolnshire Marriott at 10 Marriott Drive in Lincolnshire, threeembersrestaurant.com, 847-634-0100.